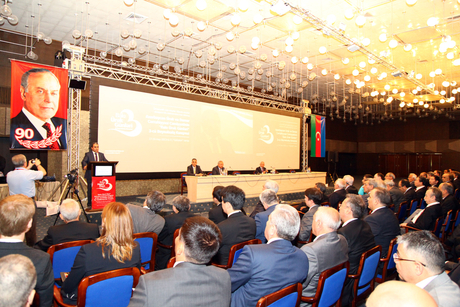 The 3rd International Congress "Baku Heart Days", organized by the Azerbaijan Society for Cardiovascular Surgery (AzSCVS) and dedicated to the 90th anniversary of National Leader Heydar Aliyev, started in Baku on May 17. Opening the three-day event, AzSCVS chairman Kamran Musayev read out Azerbaijani President Ilham Aliyev's congratulatory letter. Musayev said that holding of the event in Azerbaijan is a logical result of the healthcare policy of National Leader Heydar Aliyev continued by President Ilham Aliyev. According to Musayev, the purpose of the congress is contribute to the development of cardiology and cardiovascular surgery in Azerbaijan, to exchange experience with foreign experts and to discuss the latest innovations in the field of medical science with the leading experts of the world. The event will also provide an opportunity for Azerbaijani experts to take advantage of international experience. More than 100 cardiologists and heart surgeons from 38 countries are in attendance. It was noted that the first open heart surgery was carried out in Azerbaijan in 1971. "While developing the program for the congress, we tried to cover the most disputable problems of cardiology and cardiovascular surgery and maintain a high scientific-practical level of the congress," Musayev said. "Traditionally, both local and foreign specialists will be able to send their abstracts electronically. These abstracts will be printed in a special booklet of the congress and distributed among all participants." "Live transmission of the surgeries on disputable patients that we will conduct jointly with the most eminent specialists of the world will enhance the scientific-practical significance of the Baku Heart Days international congress. The event will feature the practical course on Surgical Anatomy of the Heart," Musayev said. Director of Scientific Surgery Center named after M. Topchubashov, academician Boyukkishi Aghayev, Russian academician Renat Akchurin and others during their speeches assessed gathering of world-known cardiologists in Baku as an indicator of the development of the healthcare system in Azerbaijan. Participants noted that holding such an event is particularly important at the present time of increased cardiovascular diseases in the world. On the second day, a hands-on course on Surgical Anatomy of the Heart will be delivered on animals' hearts. "In the framework of the Congress the hearts of animals will be operated on for the education of young cardiac surgeons for the first time in Azerbaijan," Musayev told journalists. Musayev also said foreign professors will teach students the anatomy of the heart and how to conduct surgeries.